At Cool Breeze Boats & Jet Ski Rentals, we provide a wide variety of high-quality boats and jet skis to people in the Nokomis, FL region. We pride ourselves on the affordability of our rentals and our outstanding customer service. 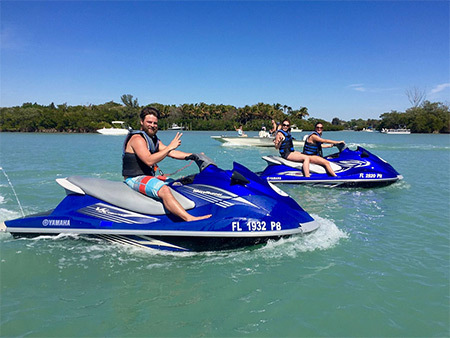 Founded in 2005, Cool Breeze Boats & Jet Ski Rentals is one of the premier providers of jet ski and boat rentals in Venice, FL! With more than 10 years of experience in the area, we have developed an outstanding reputation for our high-quality customer service and low prices. We pride ourselves on providing affordable rentals for all types of boats, kayaks, jet skis and other watercraft and water sporting equipment. Our goal is to get you out on the water in an affordable, efficient way on safe, high-quality equipment so you can get out and make some lifelong memories while having fun on the ocean! We hold a Certificate of Excellence with TripAdvisor, which means you can trust in the quality of our services. We commit ourselves to providing friendly, helpful customer service at all times. We have more than 11 years of experience in providing high-quality watercraft rental services. We have extremely high-quality pieces of equipment. We are proud members of the Osprey Nokomis Chamber of Commerce and the Venice Area Chamber of Commerce. For more information about renting jet skis and other watercraft in the Venice area, contact the team at Cool Breeze Boats & Jet Ski Rentals! Call and ask about our Snowbird Special! "Our family has rented waverunners every year. Great staff. Great location." "So much fun. We live in Bradenton. My husband and I came down for the weekend. The equipment is in great shape. Johnny was a great guide..."
"came down for our anniversary, first time in the area and it was perfect. The guys were super nice, boat great and views priceless. recomme..."
"If I understand correctly, Cool Breeze recently changed hands in the summer of 2016. The owner is working hard to keep reliable, clean, four..."